Burmese pro-democracy leader Aung San Suu Kyi has met a member of the country's ruling military government for the first time since early 2008. 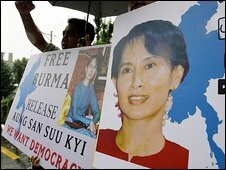 Ms Suu Kyi, who is under renewed house arrest in Rangoon, met labour minister Aung Kyi, her lawyer said. The meeting came one day after a court rejected her appeal against her 18 month sentence. There was no official word on what they discussed, but Ms Suu Kyi has offered to help negotiate an end to sanctions. Aung Kyi has met Ms Suu Kyi on six previous occasions, the last time in January 2008. "The meeting lasted about 50 minutes, but I don't know what was discussed," a home ministry official told Reuters news agency. Nyan Win, her lawyer and an official from her opposition party, the National League for Democracy, said: "I don't know what they discussed, but I believe it could be related to the letter sent last week to the senior general [Than Shwe]. Ms Suu Kyi recently made a formal offer to the military rulers to help negotiate an end to international sanctions. Reports suggest she has softened her views on sanctions in recent times, concluding that they are adversely affecting the lives of ordinary Burmese. Earlier in the week a senior US official confirmed he had met a Burmese government minister in New York - the first such contact in more than 10 years. That came after the US announced a new policy on Burma, which consists of a mix of sanctions and dialogue. Aung San Suu Kyi's party won Burma's last elections in 1990 but was never allowed to take power. Observers believe Burma's military authorities want to keep the pro-democracy leader in detention until after polls scheduled for next year.